A. Description of Premises. Landlord hereby leases to Tenant, and Tenant hereby hires from Landlord, for the term, at the rental and upon the covenants and conditions hereinafter set forth, that portion of the real property described in Exhibit A attached hereto and made a part hereof, located in the City of ________________ , County of ____________________, State of _________________, commonly known as ________________ Neighborhood Shopping Center (referred to herein as the "Shopping Center.”) Such leased portion consists of the commercial space shown and described on the plan attached hereto as Exhibit B and made a part hereof (the “Premises”) and the non-exclusive right to use the Common Area (defined in Section 3.C. below) as set forth herein. Landlord reserves the use of the exterior walls and roof of the Shopping Center and reserves the spaces between the exterior walls and the interior walls of the Premises, between the roof and the ceiling of the Premises and beneath the Premises. B. Changes In Shopping Center. Landlord reserves the right to expand the Shopping Center, to demolish or reconstruct improvements in the Shopping Center, to delete land areas from the Shopping Center and to erect unrelated improvements thereon, to modify the parking area, to expand or reduce the parking area or the Common Area and to make other changes and modifications in the Shopping Center. Any plot plan attached hereto shall not delimit the Shopping Center nor bind Landlord to any specific development plan. Landlord also reserves the right to change the name of the Shopping Center. C. Relocation. Landlord reserves and is hereby granted the right, upon not less than thirty (30) days written notice to Tenant, to relocate Tenant and to substi­tute other space within the Shopping Center for the Premises originally leased hereunder for all uses and purposes as though originally leased to Tenant at the time of the execution hereof; provided, however, that the substituted Premises shall contain an area not less than the square footage contained in the space originally leased, all without any increase in the rent hereunder. Landlord agrees to pay the expenses rea­sonably incurred by Tenant incidental to such substitution of Premises, including moving expenses. Landlord agrees to furnish the substitute Premises with decoration and im­provements similar to those in the original Premises. A. Delivery of Premises. Upon the first date that it is appropriate to do so, Landlord shall give written notice to Tenant that Landlord’s Work (as described in Exhib­it C attached hereto and made a part hereof) has been substantially completed in accordance with Exhibit C. Certification by Landlord’s architect (as designated in Exhibit C) that Landlord’s Work has been substantially completed shall be conclusive and binding upon the parties hereto. Upon giving such notice, Landlord shall deliver to Tenant and Tenant shall accept from Landlord possession of the Premises, at which time Tenant shall comply with all the terms, covenants and conditions contained in this Lease; except that Tenant shall not begin making payments of the Minimum Annual Rent, Percentage Rent and Operating Charge until the Commencement Date (all as hereinafter defined). Occupancy of the Premises by Tenant, commencement of Tenant’s Work as set forth in Exhibit C by Tenant, or other acceptance of the Premises by Tenant constitutes acceptance in their then condition. B. Commencement of Term. The term of this Lease (i) shall commence on the day (the “Commencement Date”) which is the earlier of (a) the 45th day after the date Landlord has delivered the notice of substantial completion described in Section 3.A. 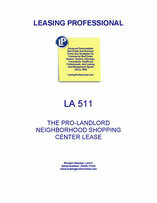 above to Tenant, but no earlier than the opening of the Shopping Center for business, or (b) such earlier day as Tenant may open for business in the Premises; and (ii) shall continue, unless sooner terminated, for the Lease Term specified in Article I. Tenant shall commence Tenant’s Work as set forth in Exhibit C, including without limitation the installation of fixtures and equipment, promptly upon delivery to it of possession of the Premises and shall diligently prosecute such work to completion and shall open the Premises for business not later than the Commencement Date. Promptly after the Commencement Date, Landlord and Tenant shall execute a memorandum confirming the exact Commencement Date and expiration date. In the event the term of this Lease shall not have commenced within four (4) years from the date of this Lease, this Lease shall terminate, Landlord shall return the security deposit and advance rental payments to Tenant, each of the parties hereto shall be released from any further obligation here­under, and Landlord shall not be liable to Tenant for any damages caused by or resulting from such failure of commencement; except that such four-year period shall be extended by the period, if any, during which Landlord is prevented from substantially completing the Landlord’s Work by reason of strikes, natural disasters, public disturbance, acts of war, acts of God or other matters not within the reasonable control of Landlord; provided, however, that no such extensions of time shall exceed one year in the aggregate. Except as otherwise specifically stated in this Lease, the phrase “term of this Lease” shall include the original term and any extension or renewal thereof. (1) Payment Monthly. Commencing on the Commencement Date, Tenant shall pay to Landlord for the Premises the Minimum Annual Rent set forth in Article I hereof in twelve (12) equal monthly installments during each year, in advance, on the first day of each calendar month, without demand, setoff or deduction. Should the Commencement Date be a day other than the first day of a month, then the Minimum Annual Rent for the fraction of the month at the beginning of the term of this Lease shall be computed on a daily basis for the period from the Commencement Date to the end of such month as an amount equal to 1/360th of the Minimum Annual Rent for each such day, and thereafter shall be computed and paid as provided herein. The first month’s rent shall be payable on execution of this Lease. (i) The base for computing the adjustment is the Consumer Price Index for All Urban Consumers (CPI-U) for the U.S. City Average for All Items, 1982-84=100 (“CPI”) published by the United States Department of Labor, Bureau of Labor Statistics, which is published for the month nearest the date of the Commencement Date (“Beginning Index”). If the CPI published for the month nearest the Adjustment Date (“Extension Index”) has increased over the Beginning Index, the Minimum Annual Rent for the period until the next Adjustment Date shall be set by multiplying the initial Minimum Annual Rent by a fraction, the numerator of which is the Extension Index and the denominator of which is the Beginning Index. In no case shall the Minimum Annual Rent be less than the initial Minimum Annual Rent set forth in Article I hereof. (ii) If the CPI is changed so that the base year differs from that used as of the month nearest the Commencement Date of the term, the new base shall be converted in accordance with the conversion factor published by the United States Department of Labor, Bureau of Labor Statistics. If the Index is discontinued or revised during the term, the government index or computation with which it is replaced shall be used in order to obtain substantially the sane result as would be obtained if the CPI had not been discontinued or revised.